Raspberries are my second favorite fruit, following the blackberry. In addition to being adorable and delicious, they’re are nutritional powerhouses that are loaded with fiber, vitamins, and minerals. Through a bit of internet research, I’ve just learned that raspberries are members of the rose family, and that raspberry flowers are an excellent source of nectar for honeybees. Neither of those facts have anything to do with baking, but they’re fun nonetheless, eh? I hope to cultivate raspberries someday, alongside the prolific blackberry bushes in our backyard garden, but you won’t need fresh or even frozen raspberries for these cupcakes. Today’s raspberry buttercream was made with raspberry jam, which can be found year-round in your local grocery store (and my refrigerator). These cupcakes were a trial run for another paying baking gig, and according to Mike they are quite delicious. Since I’m observing a sweets fast for the next couple of months, I’ll have to take his word for it. Note: this recipe yields enough for 24 miniature and 10 regular-sized cupcakes, but you could bake them all in miniature if you like. I’m not sure if the recipe would yield 4 dozen miniature cupcakes, but I believe it would come very close. In a large mixing bowl, combine flour, cocoa powder, sugar, baking soda, and salt. Mix until well-blended, then make three wells for the wet ingredients. Place vinegar, vanilla, and vegetable oil into the wells; add water and mix until the batter is smooth. The mixture will bubble up slightly when you add the water, so just keep mixing until you get a smooth consistency in the batter, which will be fairly thin. Using a one-inch cookie scoop, fill miniature liners to about half-full; you can use a 1/4 cup measure for the regular-sized cupcakes to fill the liners. Bake miniature cupcakes for 8-10 minutes, until a cake tester comes out clean. Cool in pan for a few minutes, then remove from pan and cool completely on wire racks. Regular-sized cupcakes bake for about 13-15 minutes. In a mixing bowl, beat butter and jam until very well-combined, about two minutes; the mixture will be lumpy, but that’s okay. Add powdered sugar, one cup at a time, beating for about 2 minutes between each addition and scraping the sides of the bowl frequently. Continue to beat until frosting is very smooth. Transfer frosting to a pastry bag fitted with a plain tip and pipe onto cupcakes. 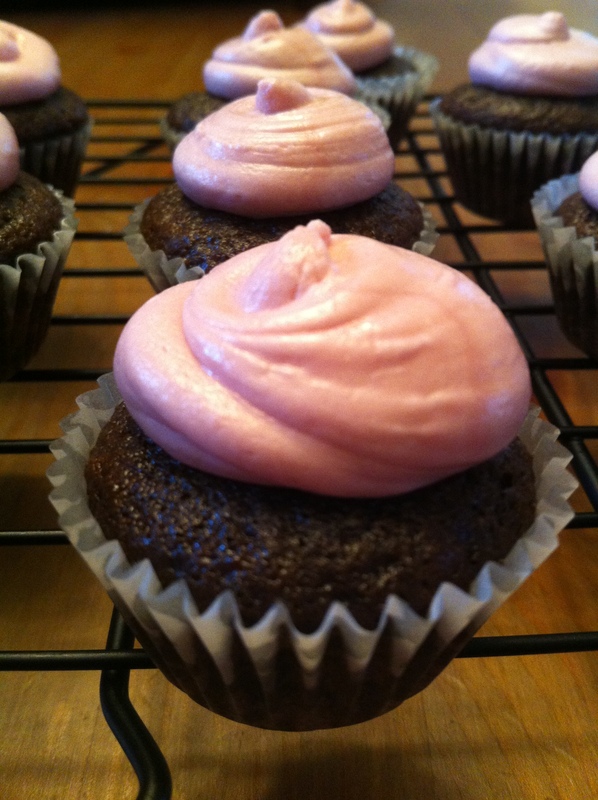 Store frosted cupcakes in the refrigerator, but bring to room temperature before serving.